Bordered by the Apennines, Abruzzo holds some of Italy's wildest terrain: silent valleys, vast untamed mountain plains and abandoned hill-villages. The name Abruzzo appears to derive from the Latin form Aprutium. The name Aprutium, however, was not in use in Roman times when the region was known at various times as Picenum, Sabina et Samnium, Flaminia et Picenum and/or Campania et Samnium. This region was known as Aprutium in the middle ages arising from four possible sources. Many think it is apparently a corruption of Praetutium, or rather of the name of the people Praetutii, applied to their chief city, Interamnaes, now present day Teramo. Another etymology is from the Latin “aper” (boar) so that Aprutium was the “land of boars” or from “abruptum” (rugged, steep). A more recent etymology is from the Latin expression “a Bruttiis” (from the Bruttii) meaning the land that began from the Bruzi people, who moved south to occupy Calabria. One region until 1963, Abruzzo and Molise – previously just plain Abruzzi – together make Italy’s transition from north to south. Both are sparsely populated mountainous regions prone to earthquakes, and both have always been outside the mainstream of Italian affairs. You could spend a whole and very varied holiday in Abruzzo. Bordered by the Apennines, it holds some of Italy’s wildest terrain: silent valleys, vast untamed mountain plains and abandoned hill-villages, as well as some great historic towns, many of them rarely visited by outsiders. But this is only half the story: the Abruzzesi have done much to pull their region out of the poverty trap, developing resorts on the long, sandy Adriatic coastline and exploiting the tourist potential of a large, mountainous national park. 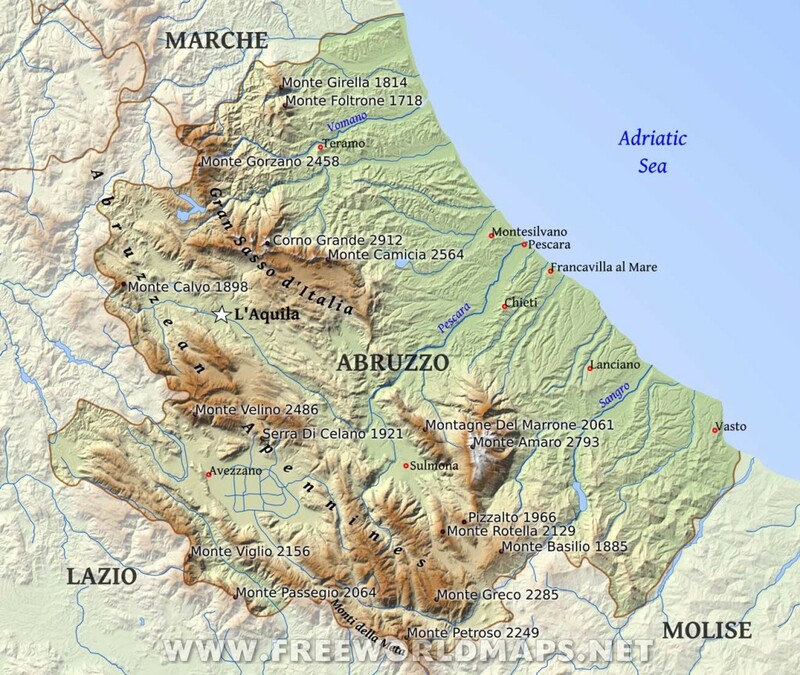 Abruzzo is a mountainous region where agriculture is difficult and sheep-farming dominates. The diet of the area is consequently dominated by lamb: abbacchio, unweaned baby lamb that is usually cut into chunks and roasted; and castrato, castrated lamb, when the meat is often cooked as a casserole with tomatoes, wine, herbs, onion and celery (intingolo di castrato), while the innards are typically roasted in the oven (alenoto di castrato). Look out as well for agnello a cutturo, an aromatic herby casserole served with bread. The other crucial ingredient in the region’s cuisine is chilli (peperoncino in the rest of Italy, but known locally as pepedinie), used liberally in all kinds of dishes; in a region prone to magic and superstition, it is believed to be a cure for ailments ranging from neuralgia to arthritis. Abruzzo is most famous for maccheroni alla chitarra, made by pressing a sheet of pasta over a wooden frame wired like a guitar; usually it is served with a tomato or lamb sauce. Other local pastas include the roughly cut strengozze and maltagliati, both inevitably served with a lamb sauce. Cheese tends to be pecorino – most often mature and grainy like parmesan, but you may come across young cheeses that are still mild, soft and milky. Situated in the centre of Italy, Abruzzo lies just an hour’s drive from Rome. Whether you’re interested in hiking on the slopes of the Majella mountain range, wine tasting along olive-strewn roads that disappear into the labyrinths of ancient towns, shopping through the sunny, pastel streets of Pescara or skiing on the highest peaks of the central Apennines, Abruzzo has something for everyone. The most comprehensive guide available, this edition has been updated throughout and is invaluable for anyone visiting the region.